Nueva Palmira is situated at km 0 on the left bank of the River Uruguay 300 km northwest of Montevideo and has a population of about 9000. It lies at the mouth of the River Uruguay and faces the mouth of the Paraná Bravo (the northern arm of the Paraná, where it flows into the River Plate Estuary). For some years now it has been declared a free zone and is best known for the private transshipment terminal established by Navios, where certain bulk cargoes ex barges from Brazilian, Bolivian and Paraguayan up-river ports are discharged, stored and then loaded as exports on ocean going vessels. At Nueva Palmira in addition to Navíos Terminal there is the state owned wharf known as Muelle Ultramar. This lies immediately north of the Navios Terminal and in line with its outer berth. In addition to the above, a private new quay, was inaugurated on August 2007, intended to move citrus, wood pulp, fertilizers, containers and sugar exports; also oil deposits for domestic trade are planned. 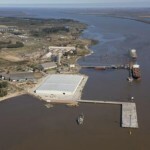 As from may 2008, coastal feeders begun fruit cargo movement to Montevideo for later export. In the free zone, fruit shippers (Frigofruit), operate their cold store. 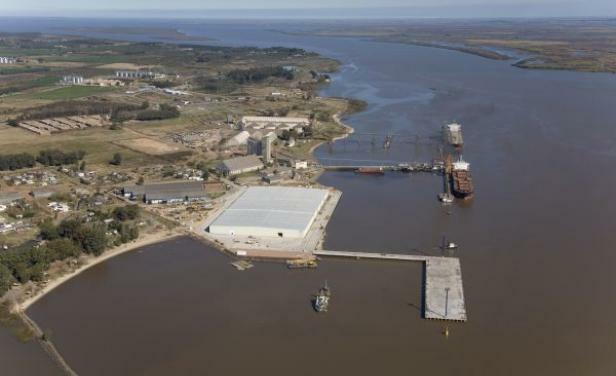 Plans are to construct new terminals downriver from Navíos Terminal: Cartisur (liquid bulk & oil) and Bellwood (grain terminal). Drafts at Nueva Palmira depend on the route taken; via Martín García this channel is dredged to 9,75 m at datum. A toll, similar to the Mitre channel will be charged. Via Paraná Bravo / Mitre Channel around 10,21 m FW subject to depths in the Talavera passage. If proceeding via Mitre Channel then LOA limitation 230 m.
Coastguard (PNN) – Customs House. Only M.G.O. and D.O. can be supplied at Muelle Ultramar by truck from Montevideo. By any means via Montevideo, general agents or direct to Nueva Palmira. If vessel comes from South Atlantic Uruguayan pilots must board at Montevideo road, who berthed vessel. If vessel comes from Argentine ports with Argentine river pilot, Uruguayan pilot must be nominated for berthing. On sailing Uruguayan pilot must be nominated and comes from Montevideo. It is compulsory at Navíos Pier. Upto official pier, it depends on Pilot/Agent. Two tugboats available from 1100/4000 BHP. Only minor repairs can be effected.